We owe the way we see California today in part to the painter Richard Diebenkorn, "whose deeply lyrical abstractions evoked the shimmering light and wide-open spaces" of the state "where he spent virtually his entire life." Those words come from his 1993 New York Times obituary, which suggested that Diebenkorn's resistance to brief aesthetic movements and art-world fads (a resistance aided by the distance between California and New York) would ensure that the influence of his vision long survive him. Now, thanks to Stanford University's Cantor Arts Center, we can look more closely than ever at what went into that vision in a new online exhibition of Diebenkorn's sketchbooks. 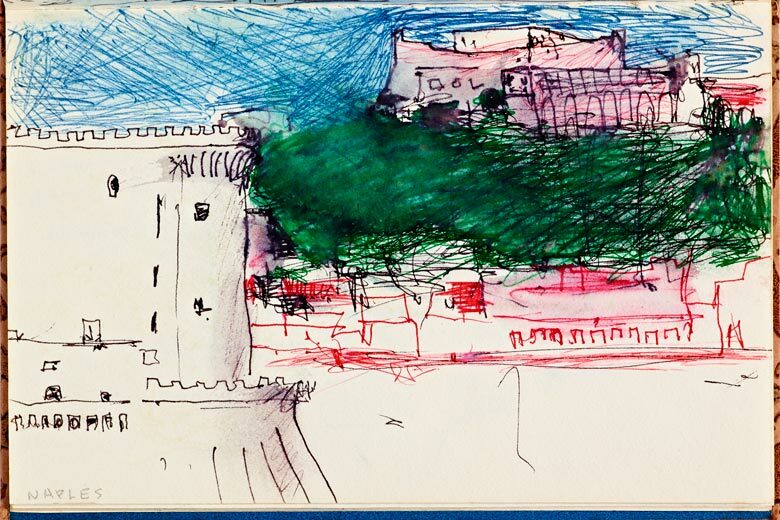 "Throughout his long career," writes the Stanford Report's Anna Koster, "Diebenkorn, AB '49, kept a sketchbook – a 'portable studio,' as he called it – to capture his ideas. These books, now in the Cantor's collection, span 50 years and represent the range of styles and subjects he explored, including deeply personal portraits of his wife, studies of the figure, landscape studies and compositions that point to Diebenkorn's signature blend of figuration and abstraction." The sketchbooks, donated by the artist's widow and the Diebenkorn Foundation, currently sit on display at the Cantor's exhibition Richard Diebenkorn: The Sketchbooks Revealed, which runs through August 22, 2016. But if you can't make it to northern California before then, you can have a look at all of them online and behold in detail their 1,045 drawings spanning fifty years of Diebenkorn's life. They give not only an insight into how he rendered the material for so many of our California dreams, but how he handled his famously contrarian oscillations between styles, from Abstract Expressionism to figuration and back to the abstract again, with some of his richest work in-between. "I was never throwing things away when I switched from one way of painting to another," he once said. "You can see a continuum from representation to abstraction, although I must say it never felt like a smooth transition while I was in the middle of it."